Think of this scenario, you’ve just about managed to drag yourself out of bed and get dressed for the freezing weather. You make your way towards your car and attempt to unlock the doors, only to find they’re frozen shut. How frustrating! Well, there are a few quick ways to prevent this from happening or to fix it if it does, so you don’t have to worry about not being able to get into your car. Inspect the gasket around your car doors. This should be done before the freezing weather sets in, giving you the time to replace or repair your gaskets if you find them to be damaged before winter time. 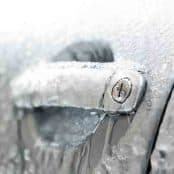 If the rubber seal that runs around the edge of your car door appears to be damaged or cracked, there may be a higher possibility of your doors freezing shut during winter. Be sure to check them carefully to see if they are torn or loose as they can let moisture in, and once this moisture freezes, the door will not open. Spray your frozen locks with a de-icer. Having a de-icer product with you during winter will come in handy in situations like this. Typically, these can be used directly onto the car lock and are extremely useful in the most severe ice conditions. To do this, choose the lock with the least amount of ice covering it, spray it directly with the de-icer and insert your key. Lubricate your car door gaskets. Using a microfiber cloth, you can spray or wipe down your car door’s gaskets with a silicone lubricant product, as this prevents moisture from building up between gaskets. If you don’t have a can of lubricant spray available, then regular cooking spray works just as well. However, you should not use these products too often, as they can damage your seals over time. After slipping on some oven gloves or using a pair of tongs, hold the end of your vehicle’s key over a lighter or a match and then insert it into the lock. If your key is fully metal, with no plastic components, you can safely heat the key whilst it is in the lock. This should be used as a last resort and if there are no other options available. Also, if you have an electric key, do not attempt this as it could cause damage, which would result in an expensive replacement. Warm the lock using a hairdryer. If there are no other options left, set a hairdryer against the lock to warm it. Should your car be outside your home and not near an electrical socket, you may use a battery-powered hair dryer or an extension cord suitable for outdoor use. Dealing with frozen car lock can be annoying. Especially if you already struggle to get to work on time, this will only cause more delay in the morning. However, hopefully, this article will help you deal with this problem, and save you from having to either desperately search for another ride on such short notice or force your car door open and cause further damage. Tags : frozen auto door solution, frozen car door solution, how to fix frozen car door, how to open a frozen car door. ← Car Trouble Starting In The Cold?